Details are available at https://www.ohiolink.edu/content/ohiolink_summit_2018#Register. 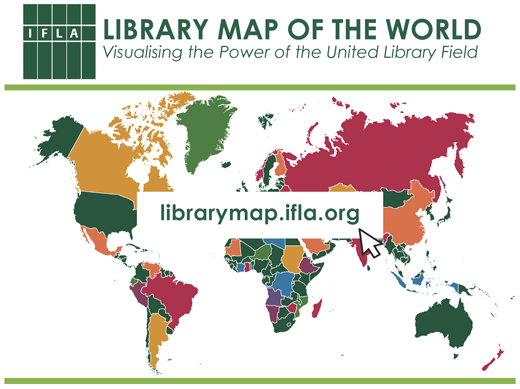 IFLA (the International Federation of Libraries Associations and Institutions) has just released a new “Library Map of the World.” It helps visualize the more than 2 million libraries in 99 countries. Fun fact: there are nearly a billion registered users! If you weren’t at the ALAO Conference last Friday, in Lewis Center, Ohio, you may not have heard the brouhaha when our Karen Plummer was awarded not one, but TWO awards! She received the Teddy award from the Technical, Electronic, and Digital Services Interest Group, which “recognizes an individual’s significant contributions to the technical, electronic or digital services fields” (http://www.alaoweb.org/igs/tedsig/index.html). Karen also received ALAO’s Jay Ladd Distinguished Service Award, in acknowledgement of her ongoing promotion of “academic libraries and librarianship not only on …her own campus, but also within the state” (http://www.alaoweb.org/aboutalao/jay-ladd-award.php). This is the second time in three years a colleague at The University of Akron has been honored with this prestigious award; Don Appleby received it in 2013. Congratulations, Karen! This is reportedly the first time a single ALAO member has won two of their awards in a single year. OCLC printed its last library catalog cards October 1, officially closing the book on what was once a familiar resource for generations of information seekers who now use computer catalogs and online search engines to access library collections. The final print run marked the end of a service that has steadily decreased over the past few decades as libraries moved their catalogs online. During the 44-year run of automated catalog card production, OCLC printed more than 1.9 billion cards. More of the story available at http://www.oclc.org/news/releases/2015/201529dublin.en.html. NOTSL will hold its Fall Meeting October 30, 2015 at Cuyahoga County Public Library’s Parma-Snow Branch Auditorium, 2121 Snow Road, Parma, Ohio. Our topic will be Don’t Be Afraid of the Big, Bad BIBFRAME (or Linked Data!). Interested in learning more about BIBFRAME and Linked Data? Wondering how to prepare your library catalog? If so, please join NOTSL as we learn about Linked Data, the Library of Congress BIBFRAME Pilot, as well as practical applications of these topics. This timely subject will be discussed by Paul Frank of Library of Congress and Roman Panchyshyn of Kent State University. Registration and program details will be available on the NOTSL website soon. 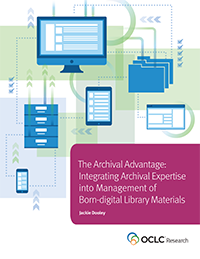 OCLC has published an essay by Jackie Dooley which argues for involving archivists in the management of born-digital library materials. It also focuses on ten areas of archival expertise and their relevance to the digital context. The report can be downloaded here: http://www.oclc.org/research/publications/2015/oclcresearch-archival-advantage-2015.html. OCLC just posted a new list of training being offered in: cataloging and metadata, digital collection management, resource sharing and delivery, maximizing, and reference and discovery. Details available here. I can hear you asking, “What is maximizing?” Find out by following this link.